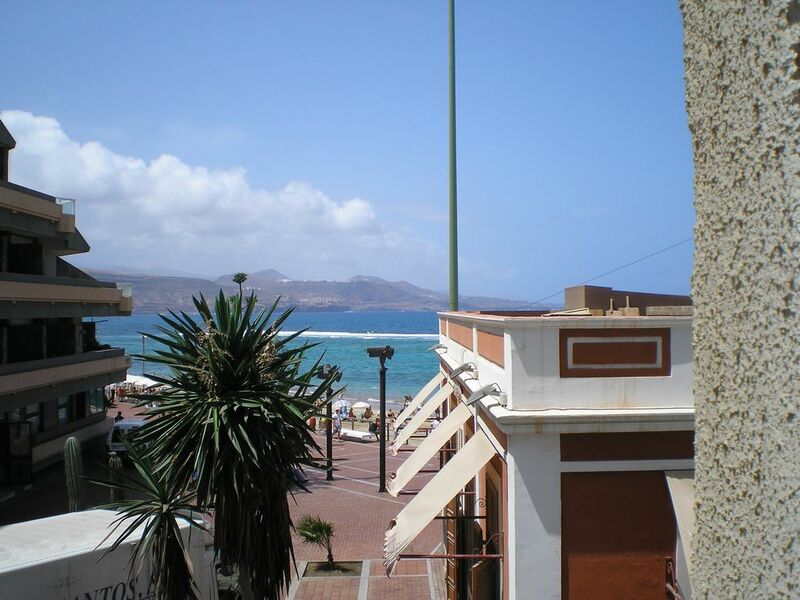 Apartment building beachfront studio with double bed, maximum 2 persons. Recently refurbished. Intercom, washing machine, including Internet connection, wifi (fiber optic), TV. Very central. With free bus to the island. This apartment has a small balcony from where the beach is. But it is not a terrace. In the city, there are also a lot of cultural activity, highlighting the Canary Islands Music Festival and the Opera Festival are annual Carnival Festival Woomad 5 minutes walk from the apartment. Dance, etc. Golf, Fishing, Boating: There are 8 golf courses on the island. And in the south, 50 kilometers of English and Maspalomas Beach can do all kinds of water sports. Skiing, water, fishing, parasailing, jet ski, etc. Also, in the center of the island there are many real hiking trails. No. 2015/1699 entry in the Register. Minimum rental 7 days. The building has a fitness professional, not included in the price. Apartment in great location. Needs equipping better with crockery and plates. Cracked cups and not matching. Only one proper cereal bowl. Furnishings tired. No sabia que había una taza agrietada, ya la tiré a la basura y he comprado nuevas. Me pediste un calefactor, y te lo compré de inmediato, pero me ha molestado tu comentario porque se publica en Homeaway y para mi es malo. Si me lo hubieses dicho tambien te lo hubiese comprado de inmediato. Saludos cordiales. Fantástico huésped, además de simpático. Puede volver cuando quiera. Gracias por tu comentario, Marco. Appartement très bien situé dans Las Palmas. Le propriétaire est très disponible, arrangeant et sympathique. Muchas gracias por tu bonito comentario Enmanuel. Saludos. Vi trivdes gott i Octavios legegenhet. Nära til allt man trenger,butiker,restauranger,beach,osv. Rummet var rent og tillfredställande. Dubbelsängen var skön att sova i.Lite för smal i mitt tycke men helt ok.
til ett bra pris, bra service syntes vi. Vi havde en dejlig ferie i Octavios lejlighed, som ligger helt utroligt centralt. Alt er inden for meget kort gå-afstand, især er det fantastisk at strand ligger lige ved siden af. Vi savnede dog den terrasse, der bliver nævnt. Måske den var et andet sted i bygningen, det undersøgte vi ikke. El apartamento está muy bien situado en la playa de las canteras. El piso tiene todo lo que se necesita para hacer de comer. Tiene el wifi y además una maquina de lavar lo que es muy cómodo. Es bastante grande para dos personas y hay muchoas alacenas. Todo pasó muy bien. Octavio el propietario nos recibió muy bien aunque lleguemos tarde por la noche. Muchas gracias por todo. Muchas gracias por tu comentario Patricia. Ya sabes que pueden volver cuando quieran. Saludos cordiales. Building on the beach, in the center of the city, 5 minutes walk from the shopping area of ​​the island. Central bus to go to any part of the island. La limpieza final son 30 euros adicionales.